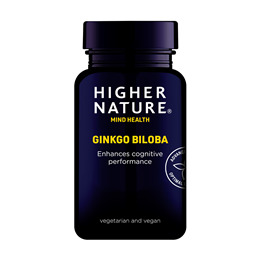 Higher Nature Ginkgo Biloba is almost certainly the strongest and most potent Ginkgo that you can buy. The guaranteed standardised extract is 50 times concentrated, so that 120mg is equivalent to 6000mg of standard Ginkgo leaves. Ginkgo leaves contains flavonoid glycosides and terpenoids (ginkgolides, bilobalides). The extract of the Ginkgo leaves may help support and maintain healthy blood flow to the brain and most tissues and organs. The ancient Ginkgo biloba tree is known today as ‘white fruit’, possibly due to its pale-coloured nuts, which are widely eaten in Asia as both a tasty snack and in savoury and sweet dishes. Its leaves are infused in hot water and then drunk as a tea. Ginkgo tea contains the flavonoids quercetin, catechin and rutin. The Japanese tea ceremony school, Urasenke, uses the Ginkgo leaf as its symbol. CONTAINS NO added sugar, salt, soya, wheat, gluten, yeast, lactose, dairy products, artificial preservatives, colours or flavourings. Not advisable if pregnant or taking aspirin or warfarin. Contains no ginkgotoxin. Ginkgo biloba guaranteed standardised extract 50:1 providing minimum: 24% ginkgo flavone glycosides, 6% terpene lactones (ginkgolides A, B, C & bilobalides). Tableted with natural ingredients; natural Lithothamnion calcarea, cellulose, vegetable magnesium stearate, vegetable stearic acid, zein protein coating. 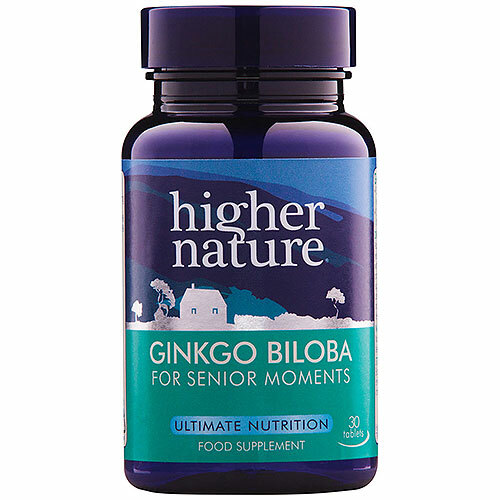 Below are reviews of Ginkgo Biloba - For Senior Moments - 90 x 120mg Tablets by bodykind customers. If you have tried this product we'd love to hear what you think so please leave a review. This is almost certainly the strongest and most potent Ginkgo that you can buy. The guaranteed standardised extract is 50 times concentrated, so that 120mg is equivalent to 6000mg of standard Ginkgo leaves.